Topical treatments are effective in controlling wrinkles, firming the skin, clearing acne and improving complexion, growing longer eyelashes and fuller eyebrows, and in fading brown spots. Advances in medical technology and skin care techniques are helping people look and feel more youthful and refreshed through skin rejuvenation. That means you can reverse photo-aging (including sunspots, age spots, hyper-pigmentation, fine wrinkles, and other evidence of collagen damage), manage rosacea, control acne, and minimize the risk of skin cancers through regular use of topical, medical-grade products. Dr. Gardner will discuss your goals and prescribe or recommend the most cost-effective way of accomplishing the improvement you desire. Below are some of the products and systems we have found helpful. Latisse® is the first and only FDA-approved prescription treatment for thin, sparse eyelashes, growing them darker, thicker, and longer in just weeks. Some of our patients have commented that their thinning eyebrows have also been growing back since using the product. To learn more, please visit the official website at www.latisse.com. Latisse® is believed to affect the growth (anagen) phase of the eyelash hair cycle in two ways: first, it increases the length of this phase; and second, it increases the number of hairs in this growth phase. The exact way it works is unknown. RETIN-A MICRO® is believed to penetrate beneath the skin to loosen acne-causing clogged pores while helping to preventing future breakouts. RETIN-A MICRO® uses an advanced technology called microspheres, which release the active ingredient slowly over time to help minimize irritation and absorb facial shine. Melasma is a darkening of the skin caused by excessive production of melanin—the pigment that causes skin to tan. That’s why the sun, which increases melanin production, makes melasma worse. Melasma occurs almost instantly on areas of skin that are exposed to the sun, like the chin, cheeks and upper lip area. It can be mild, moderate, or severe. The common causes of melasma are sun exposure, hormonal changes, and medications. Genetics and skin type may also play a role. Tri-luma® works gradually to fade the darker areas. 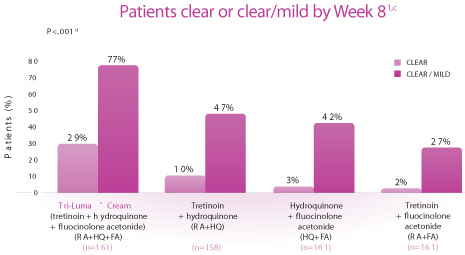 We also compound a powerful hydroquinone cream for more difficult cases.